Today's stitch comes from our friend, Ruth Schmuff. The core element for this stitch is from one of my current favorite stitches. I love how she multiplied and flipped it around to make it more compelling. Needless to say, I wish I thought of it. The stitched sample is a bevy of fun threads including Soie D'Alger (green), Petite Silk Lame (gray), and Gloriana Silk (overdye). This is from Ellen Giggenbach's Fantail from bedeckedandbeadazzled.com (available here). It's part of a small hill behind a beautiful leaf. Clearly, this is a stitch for a larger space. It would make a beautiful coat on a large dramatic Santa stand-up. It's a perfect ground covering as you can use the middle stitch (the turquoise line) to add a second color or texture. 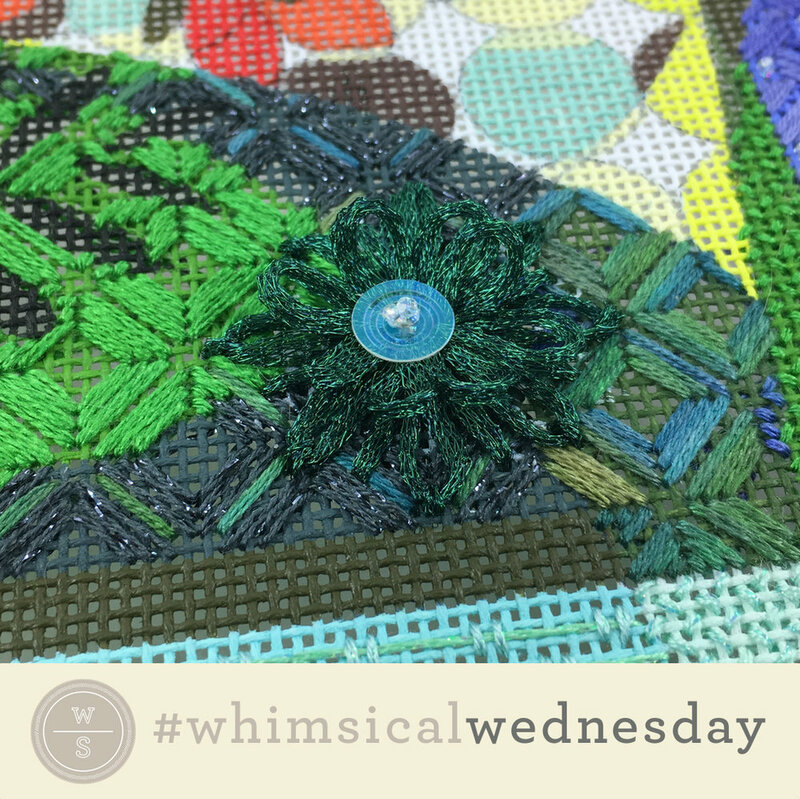 Add a bead (over two rows on the vertical) to the open 2X2 center, mix it with a Petite Silk Lame (gray lines) and Kreinik (turquoise line) for water. If you are #teamfullcoverage, add an Upright Tied Cross to the open diamond and a Smyrna Cross to the 2X2 section for very glamorous clothing, border, or flower center. There are a lot of ways to play with this stitch. If you like what you see on this blog, want to learn some very creative decorative stitches, and how to put them all together, whimsicalstitch.com sells stitch guides and stitch concepts for Melissa Shirley Designs, Zecca Designs, and Patience Brewster. Click here to see the newest guides and click here to see the entire collection.